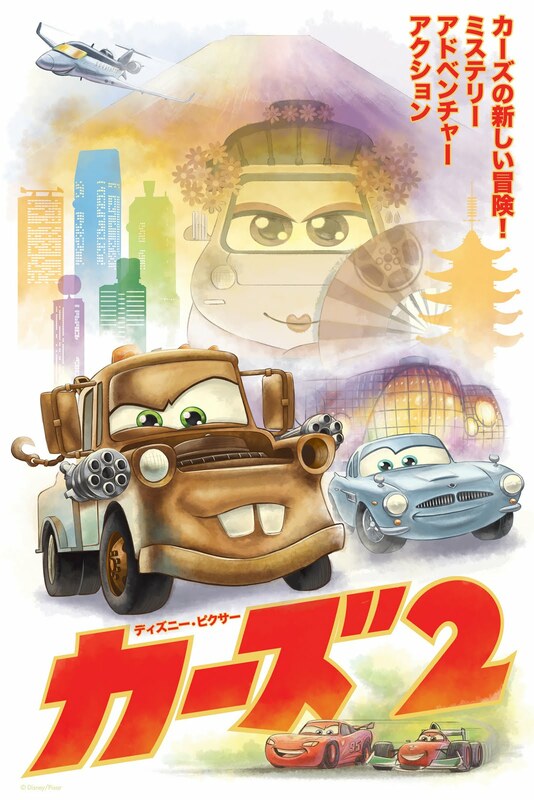 Two more Cars 2 posters were launched online the other day. The 'spy' poster, which probably has the most elements of the series, was the quickest one to complete. That's the complete opposite of how things usually go but it was the last I completed of the series and by that time I felt I had a better handle on the characters and the painting technique. It's inspiration came from looking at Bob Peak and Robert McGinnis posters. 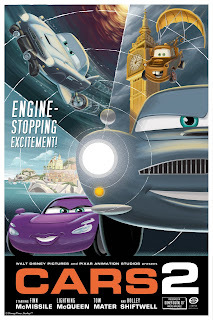 They had such a great style and design aesthetic to everything they did. 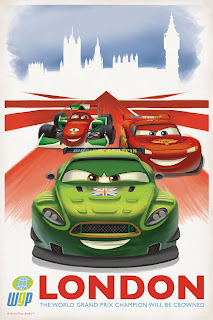 The London poster, like the Japan race poster in a previous post, are my favorites of the series. I tend to gravitate toward simple, bold graphics or the 'less is more' mantra of design. I also like the look of red on a white background too! 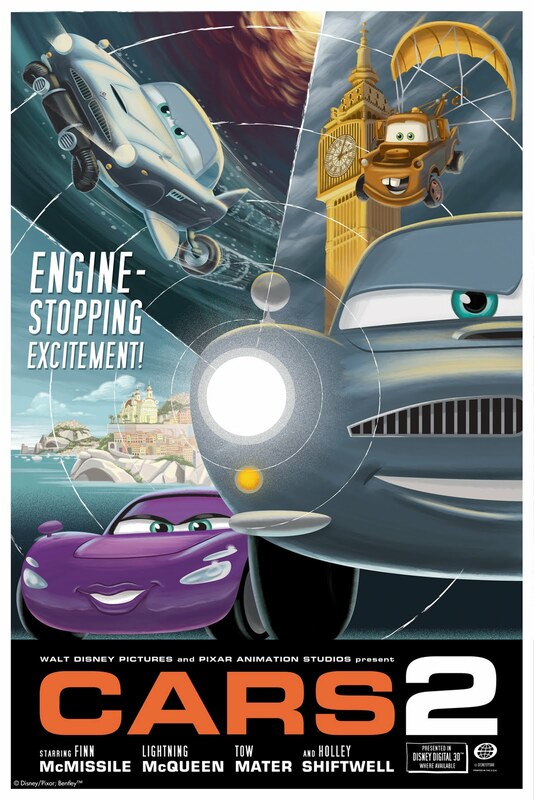 In the end, there were 11 posters we worked on in the series and it was definitely the most challenging yet because of the multiple characters, settings, and genres. The various paint styles were also something I had to really push myself to learn. Continuing to grow and progress is always a good thing and I'm very fortunate to be asked to work on as cool a project as this was. 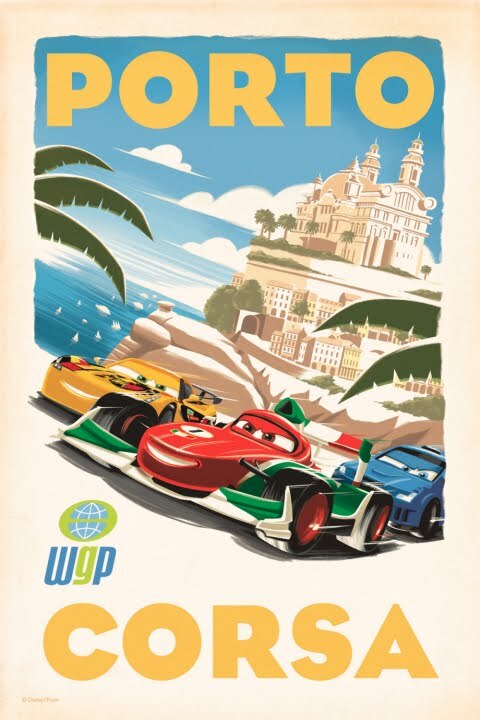 I already can't wait for the next one! Here's my contribution to the 'Required Reading' show which opened last night at Gallery 1988. 40 artists were each given a literary classic to interpret in their own style. 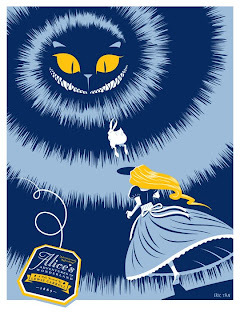 I was fortunate to get 'Alice's Adventures in Wonderland', a book that i remember reading over and over as a kid. Being one who suffers from A.D.D., it was always a tolerable read for me because it's one of those rare books where you can dive in at any point and not feel lost that you didn't read anything prior to that scene. The whole world within it was so rich and whacked out, and i could read a random part then put the book down and run down the street or sleep in the grass and feel completely fulfilled. I was a weird kid! The cast of unique and memorable characters and the amazing illustrations by John Tenniel would inspire me to break out the crayons and try to draw my own Cheshire cats and Tweedle Dees and Tweedle Dums. When it came to coming up with the concept for my poster, I knew i had to capture a world that was swirling out of control and highlight Alice's journey into this crazy abyss. The tea label idea for the book's title came about because I was also working on a freelance gig for a friend who just happens to sell her own line of teas. It seemed very fitting because the tea party was one of my favorite parts of the story. The print, titled 'Follow Hobson: A Tribute to Alice's Adventures in Wonderland' is named after my coworker Carrie, whose last name is Hobson and who our team just happened to nickname the 'white rabbit' for her ability to quickly hop past everyone when they do their long runs (my team is a bit weird too). The blue version has a run of 100, signed and numbered, and the pink version has a run of 50. They are both 18" by 24" and were screen-printed by the fine folks at D&L Screenprinting. 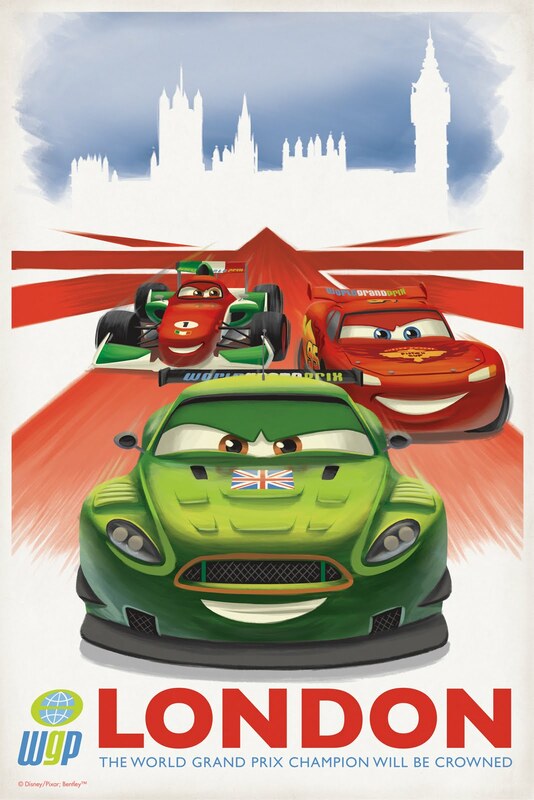 Here's two more Cars 2 posters that were launched online a couple of days ago. These were a blast to conceptualize and work on because Japan is so rich with iconic imagery and a unique artistic style. 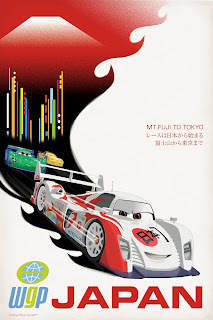 The 1st one was influenced by a combination of Japanese film posters and manga while the 2nd poster used more of a minimalist, graphic approach. Special thanks to my friend Stephane Kardos who helped to render the awesome trio of racers. Cinemablend posted 3 more posters from the Cars 2 series. 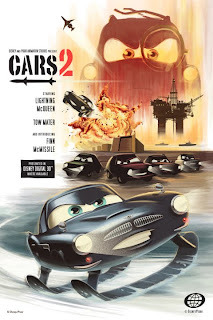 Of all the Pixar posters I've gotten the amazing opportunity to work on, the series for Cars 2 was definitely the most challenging. 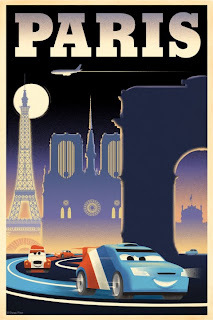 With The Incredibles, Ratatouille, Wall-e, and Up, I was able to keep a consistent look throughout each series, so once the stylization of the characters was approved it was then easy enough to concentrate on the themes and layout for each. Cars 2 was an entirely different story. With its multiple settings, characters, and themes, we knew that one style would not suffice to capture the scope of the film. Everything from minimalist Japanese design - to vintage Italian racing posters - to spy film graphics, were used as inspiration to create the series. Pixar has always been amazing at compiling tons and tons of reference material for each film and it was a life-saver when it came to nailing down the 'authenticity' of these. For me, challenging = fun, and it was a blast to switch back and forth in design aesthetic and rendering style. I definitely learned a lot of new tips and tricks within Photoshop on this project. A special thanks to Harley Jessup and Jay Shuster for their sage-like advice in getting these to where they are. Vanessa, one of my good friends at work, always keeps me up to date on the latest and greatest restaurants and dessert joints around town. She's a definite 'foodie' who gets irritable during the hours between breakfast, lunch, and dinner. I tend to throw snacks on her desk before meetings just so she won't scream at everyone once the meeting begins. Her intense passion for food is only matched by her intense passion for picking at her fingers til they bleed. I have no idea what that behavior is about, but I do get a kick out of counting how many band-aids she uses in the span of a day. I love creating personal cards utilizing my sick sense of humor for my friends, so when it came to Vanessa's birthday, I wanted to capture her passion for food....and band-aids. 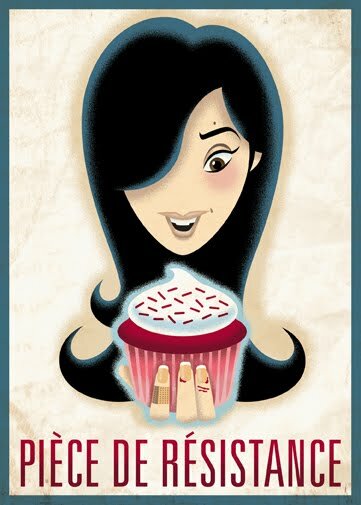 The 1st one is inspired by French food posters and her addiction to sweets. 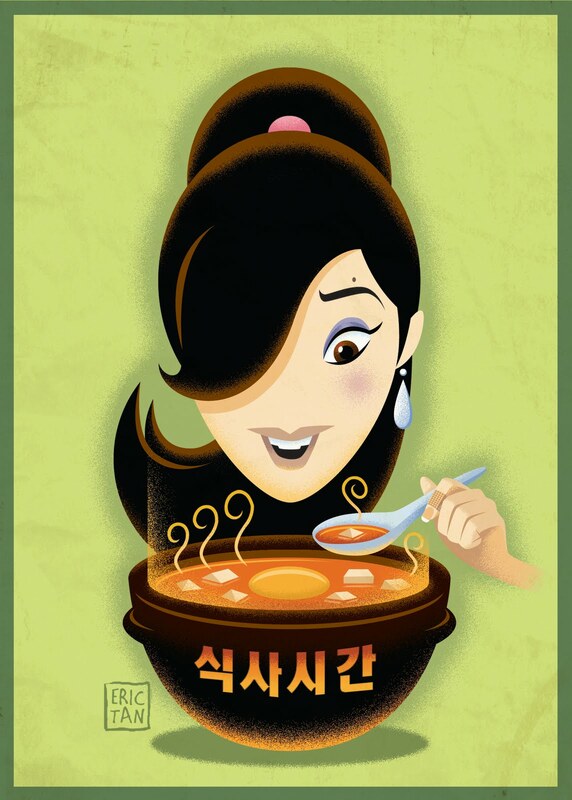 The 2nd one involves her love for Korean tofu soup. I may have gone a little overboard on the bloody fingers featured in the cupcake poster. And I may have been too nice with just the one band-aid in the tofu poster. On an average day, Vanessa's fingers look somewhere in between the two. If you're lucky enough to meet her one day, I'd pass on the handshake and just give her the old 'fist bump'. Better safe than sorry! ;) Happy Birthday Vanessa!! !